Precap: Ananya begins her journey with Airlines and works as the first pilot recruit. later in her journey as the pilot, She have a row with Akash but later sorts out after he takes back the complaint. Akash saves her life from a drug gang when the drug bag was exchanged with her travel bag. Ananya learns that Akash carries a gun but he gives some excuse. Ananya shows respect for Akash and is coming close to him. A patient’s relative is at hospital in Bhopal and the doctors are giving her support and they need 4 hrs to transfer that donor heart to Mumbai and they think it would be fine. At 10:00 am, Akash meets Natasha at the airport. The patient’s relatives are going with the donor heart in an ambulance on the road and at the airport Natasha sees Ananya and suggests that whenever Ananya is there, there should be some excitement. Akash goes with Ananya to fly the flight. Akash and Ananya are in Delhi. Captain Rathod at the Delhi office of the airlines wants a hike. On Natasha’s end, she speaks of a roster change and also cites her mother is ill and wants the shift – Delhi – Bhopal – Mumbai and she finally gets a swap. Rathod speaks with the senior and he makes a stand that plane will not fly for the next 6 months. Ananya and Akash are in the cockpit and speaks of a pilot strike. He makes a joke at Captain Rathod and she smiles. Captain Rathod wants Hike or they are going on strike. Akash in the cockpit prepares to fly and Natasha welcomes him and he becomes surprised and he asks her that she was in Delhi- Mumbai-Goa. She flirts with him a bit and leaves. At the Bhopal Airport, there are 3 1/2 hrs for the donor heart transport. The relative of the patient wishes to have some special bag after seeing a woman carrying it and blames her destiny. She then finds a man speaking loudly about pilot strike and then knows from him the same. She then remembers about donor heart details provided by the doctors and it has 4 hrs of time and after then it will be damaged. She speaks at the counter that she has to reach Mumbai and its emergency. She then speaks to the lady there that her husband’s donor heart has to be transported and then asks whether plane has taken off from Delhi and learns that plane has not taken off from Delhi. Captain Rathod wants 30 % hike and the seniors wants some time and he speaks of 1 hour. The senior wants 6 months time to decide whether they will give hike on salary. Rathod speaks to other pilots that they are on strike and he learns that IDA 315 has already taken off. He wants that flight to have emergency landing and abort and wants a press conference. At Bhopal, the patient’s wife learns that flight has taken off from Delhi. There are 3 hrs left. Akash makes the announcement in the plane that they have taken off and will reach destination 10 mins before arrival. At the hospital in Mumbai, the lady’s husband is waiting for heart transplant. Ananya looks at the clear sky and view. He asks her whether she will do poetry. She then asks him when he has became poetry. Akash has been told to fly until Bhopal since they are on pilot strike. Akash agrees and calls Natasha and informs her that pilot strike has been cancelled. Natasha is happy to know it and speaks that Bhopal is an amazing vacation spot and also doesn’t want to inform the passengers. Akash and Ananya asks her to inform passengers so they can arrange another flight. Akash speaks that he will not say truth to passengers and he cares about their comfort and safety. He cites unavoidable reasons as an excuse to not fly from Bhopal to Mumbai. He then informs the cabin crew for landing and suggests that whatever he did was according to the protocol which she respects a lot. At the Bhopal, now the remaining time is 2:44 hrs. Akash lands the plane and speaks that on being happy now. The lady at Bhopal is anxious and now there is 2:35 hrs left and her daughter is asking when they will be able to see her father. She consoles her daughter and the same old man is very angry with his team and fires one of his employee. The lady begins to cry while carrying her daughter in her lap. The man from the hospital is just seeing that situation while holding that donor heart. The same old man offers her water and help and takes her to the counter so that she can speak to them and convey her situation. Akash, Natasha and Ananya are coming down the stairs and the old man speaks on phone being angry again. The lady is anxious much and goes to the counter and speaks that she needs to go to Mumbai urgently and now only 2 1/2 hrs left and she remembers how the doctor gave a deadline for heart which is 4 hrs and also the words of her daughter. She contemplates and carries worry on her face and feels crying. She consolidates her daughter and the baby asks how could they go at her Daddy ? The old man sees the lady and he speaks of arranging a chartered flight but that will also take 1 hr. The lady informs that the standing plane which has been halted will take them to Mumbai today. He thinks that it is next to impossible and now only 2.24 hrs left. But anyhow he takes her to the office to give a try. Ananya is also leaving the airport and the old man identifies Ananya as the pilot of Inde Air. The lady provides details to Ananya on her situation and how the cancelled flight affects them. Ananya speaks about pilot association is on strike and the lady daughter’s asks for help. The lady starts to cry and speaks that the pilots are concerned for their money. Ananya asks the hospital staff on the time left and he replies less than 3 hrs. Ananya takes the lady with her and speaks to Akash about the family who has a donor heart box. She carries a teary face and speaks that some one will die if they don’t reach Mumbai. Akash speaks of being helpless and suggests that they cannot do anything. He speaks that she is mad to think in that way and their job is at risk. She speaks of taking that risk and also she will fly the plane all by herself. Akash tries to convince her but she insists the same thing will happen. Ananya goes to the Inde Air counter and wants to talk with the senior and then Akash takes the phone from her and speaks to the senior that because of emergency that they need to fly. He speaks of talking to the management and pilot strike haven’t been announced yet at that airport. Akash fixes the problem in few minuites and informs the lady and old man to get ready for boarding in 20 minutes. The lady’s relative (sister-in law from husband’s side) speaks to her husband and suggests that the flight is cancelled and puts bad and unfortunate things in his mouth. The lady comes and informs her relative that everything is fine and they are flying. Natasha tries to convince Akash about the risks of pilot strike but he doesn’t listen to her, she also informs him about his past. He speaks of emergency and goes to fly the flight IDA 315. He is in the cockpit and gets a permission from ATC and there is 1.55 hrs left after citing his emergency and own responsibility. 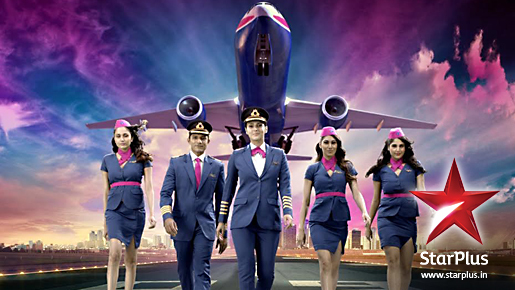 Captain Rathod learns that Akash and Ananya are flying the plane and he then calls Akash. Rathod wants Akash to abort the flight and calls it as his order. Akash speaks about the emergency and one life can go away. Rathod speaks about thousands of emergencies in India and wants Akash to abort the plane. Ananya then informs Rathod that plane will fly and he vows to teach them a lesson and see them suspended. Akash speaks that Rathod will not leave them. Ananya speaks that they have 2 hrs time and Akash speaks that they will land in 1.25 hrs. At the hospital in Mumbai only 1.50 hrs left and the doctors are worried on the situation and speaking to the patient’s brother. Akash speaks to ATC Mumbai and asks for permission and they inform of air traffic and then Akash speaks of medical emergency to convince the ATC. The ATC finally speaks of rules and Ananya speaks that principles and rules are book things and now only 1.25 hrs remains. Ananya speaks that a big industrialist and politician the rules will be broken. The plane just cruises and the ATC replies that there is heavy air traffic and Ananya tries to convince the ATC controller about the donor heart which will degenerate. She wants landing permission and speaks on managing the traffic controls herself. The lady’s husband is being taken away from the ICU and there is only 1.10 hrs left and the doctor wants the patient’s brother to sign the papers since they will be doing the surgery. Akash gets the permission to land from the ATC when only 1.01 hrs left and Akash happily lands the plane. Akash tells the ATC to arrange an ambulance as well. The lady thanks Ananya and Akash for flying the plane and he asks her to go and take the ambulance. Natasha feels jealous to see Ananaya and Akash speaking. The lady arrives with the donor heart at the hospital in Mumbai and gives it to doctors. Akash is being asked why he is doing the drama in Delhi and the man gives him an envelope and wants him to make a choice. Ananya is also in Delhi at her home and her sister gives her flowers which has been sent by the lady (Sangeeta) whose husband needed a heart donor and the happy news is that he successfully got a heart transplant. Ananya speaks that rules are set by society but thinks that to listen to your heart gives you maximum satisfaction and allows to fulfill your dreams as well. Next Episode: Ananya declines to apologize Captain Rathod on his face and later she flies the plane with Captain Rathod as co-pilot. There is another emergency in the plane with a woman in the last stage of labour and they need help. Ananya comes to the rescue of that lady but whether she would be able to give timely help to that lady is the question.